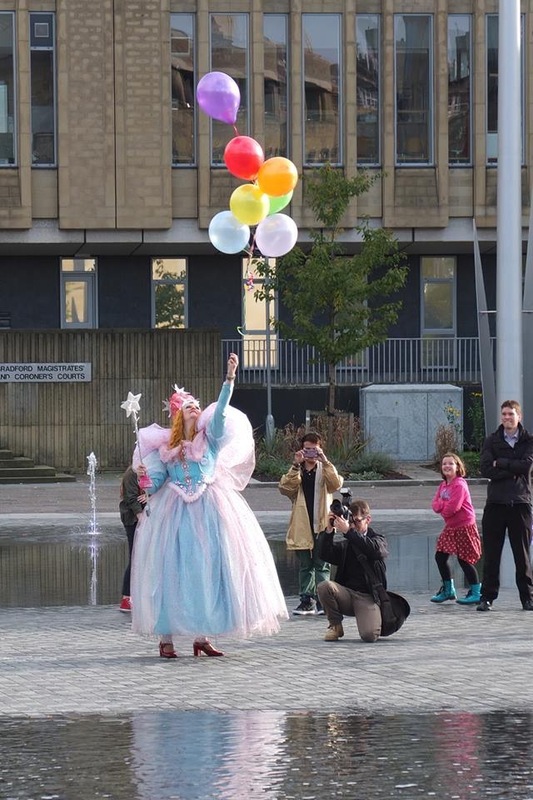 There’s no place like Bradford – if you were there on Saturday 18th October 2014 at 3.30pm you might have witnessed the extraordinary spectacle of around 100 women and girls skipping through the middle of the mirror pool in City Park. Over 75 women and girls put on their ‘ruby slippers’ and promenaded through City Park, Bradford. This ‘flash mob’ of Bradford women and girls was a celebration of the 75th anniversary of the iconic film, ‘The Wizard of Oz’, in Bradford – City of Film. The event coincided with the Born In Bradford festival, a family event that demonstrated that there’s no place like Bradford! Irregular (Arts) also screened two original short films, made with women and girls from across Bradford’s communities. 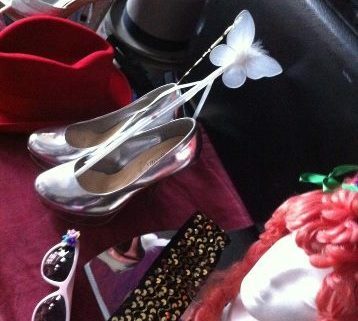 All this was followed by a screening of ‘The Wizard of Oz’ on the Bradford Big Screen. ‘Are you a good witch, or a bad witch?’, Glinda, the good witch of the North asks Dorothy Gale when she first arrives in Oz. 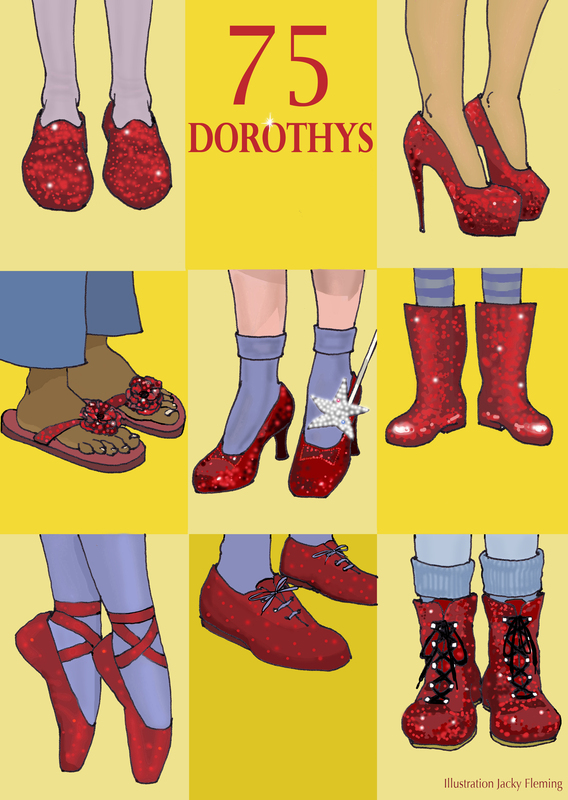 In her journey along the yellow brick road Dorothy’s new friends are searching for a heart, brains, and courage – Dorothy wants only to find her way home. These enduring themes are the basis of our exploration in ’75 Dorothys’, as Jenny Wilson and Shanaz Gulzar have been asking women to share with us ‘the dreams that you dare to dream’. We have been visiting women’s and girls’ groups across Bradford and using storytelling, film, photography, audio recording, performance and dance to explore what lies ‘Over the Rainbow’. 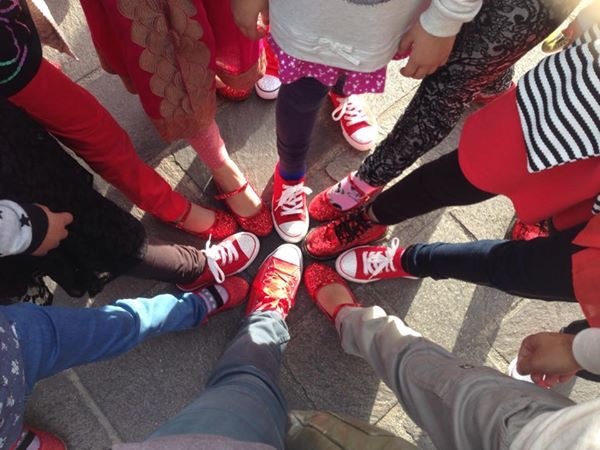 The women and girls we’ve worked with come together in a spectacular red-shoed celebration on October 18th 2014 in City Park, Bradford from 3pm-6pm (see above).